First Floor Lounge: 1 sofa, 2 swivel chairs, TV with Sky, Wifi, CD and DVD. Selection of CDs, DVD's, books and games are provided. Sliding door leading to balcony with sea views over St Brides Bay and islands. 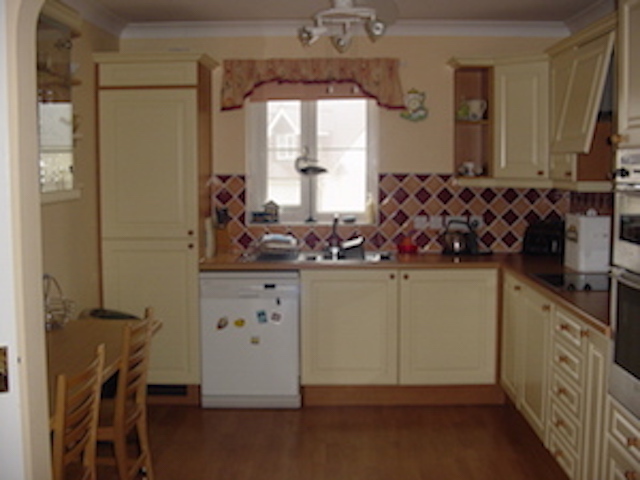 Kitchen/Diner: Fully equipped, built in fridge/freezer, dishwasher, Tassimo coffee machine (please supply own pods), ceramic hob, oven and microwave. Open plan, with lounge; lends itself to sociable entertaining. 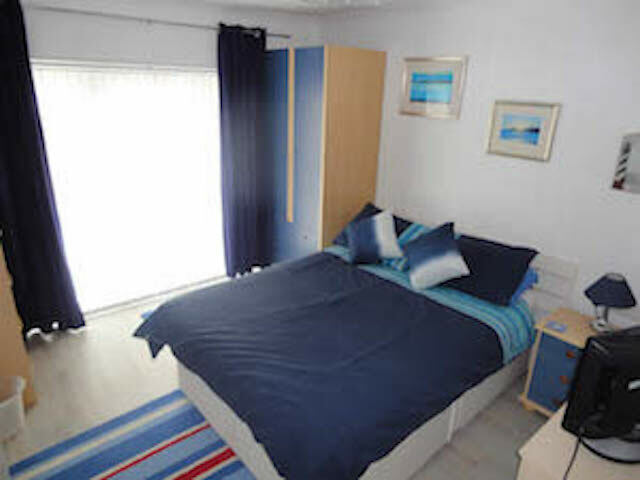 Second Floor Bedroom 1: With king size bed, duvet, pillows, built in wardrobe and tv with freesat. Second Floor Bedroom 2: With twin beds, duvets, pillows, wardrobe and tv. 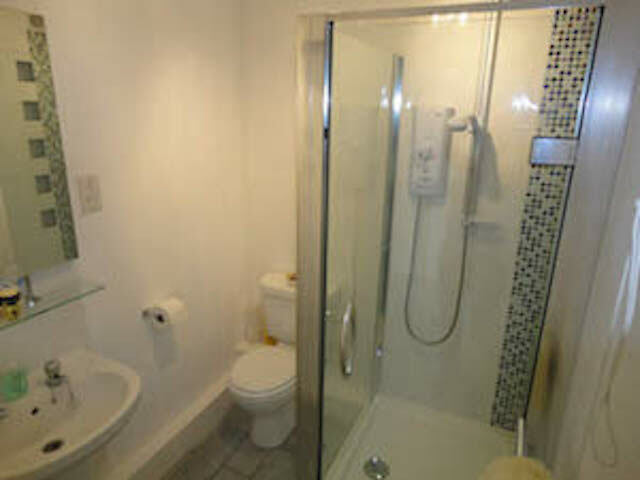 Second Floor Bathroom: Bath with hand shower attachment, w/c, sink, separate shower cubicle, mirror, wall mounted fan heater, extractor fan and shaving point. 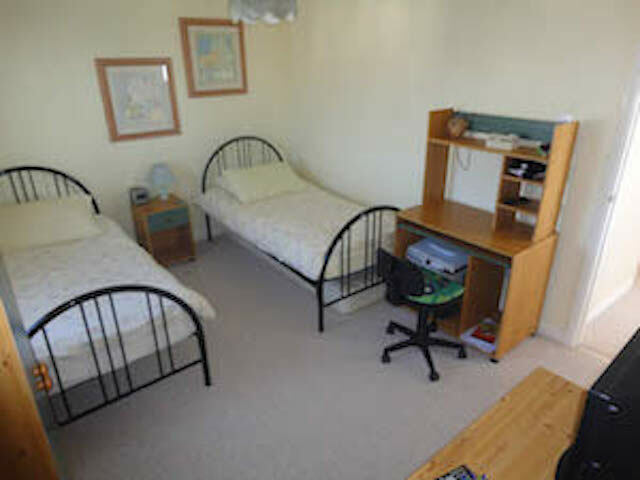 Ground Floor Bedroom: With double bed, wardrobe and tv with freesat. 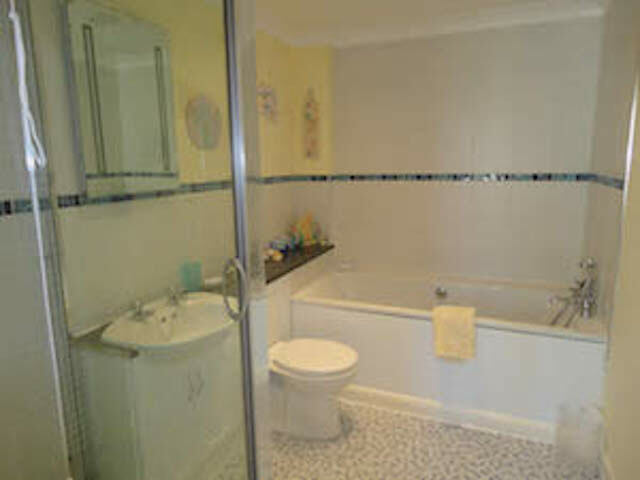 Door through to en-suite shower room with w/c and sink. Ground floor TV Room: With 1 sofa, tv, built in wardrobe with outdoor furniture and equipment and sliding door leading to garden. 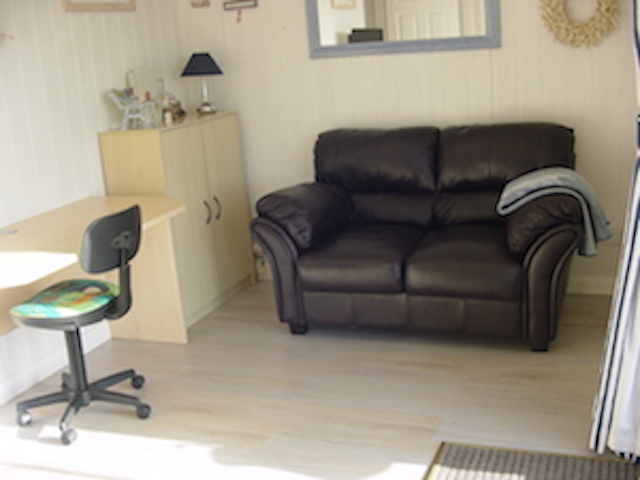 Ground Floor Utility Room: With washing machine, tumble drier and wet suits for guest use. Decked Garden: Enclosed, gated, at rear of house, sea views. Access via sliding door in tv room and path to side of house. There is also an outside hot shower at the side of the house for washing down those sandy feet!! Travel cot and high chair are provided along with a baby bath and a buggy. Guests must supply their own cot bedding. Oil fired central heating providing instant heat. Iron & board, hairdryer, vacuum cleaner. A telephone is available at the house for UK calls only. We really enjoyed our stay at 85 Puffin Way. Beautiful, well equipped house. Close proximity to the beach. Also, recommend sunshine pizza on the front .. lovely fresh food. Another fantastic holiday in Pembrokeshire. 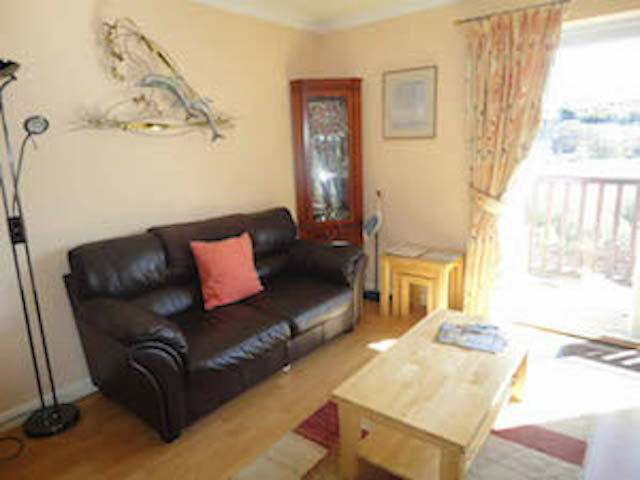 85 Puffin Way is the third home that we have stayed in at Broad Haven with Stay in the Havens. Benefits from being close to the beach as well as local amenities. Lucky to have sunshine and surf so plenty of time was spent at Newgale. Enjoyed sitting out in the garden eating fish and chips one evening. Also had some lovely meals out at The Ocean (with its panoramic views) as well as at The Griffin in Dale. Our stay was great. We got lucky with the weather which always helps. The accommodation was superb as always. Given the heatwave having remote-control ceiling fans in the living room was a pleasant surprise. The outdoor shower was such a useful addition for returns from the beach. Being able to wander out of the house and be at the beach in a minute was lovely. We had a lovely couple of days, thanks for sharing your beautiful property! We had a wonderful holiday. The house was lovely, perfect location and the best equipped house we have stayed at in Broadhaven. Stay in The Havens were excellent as always. 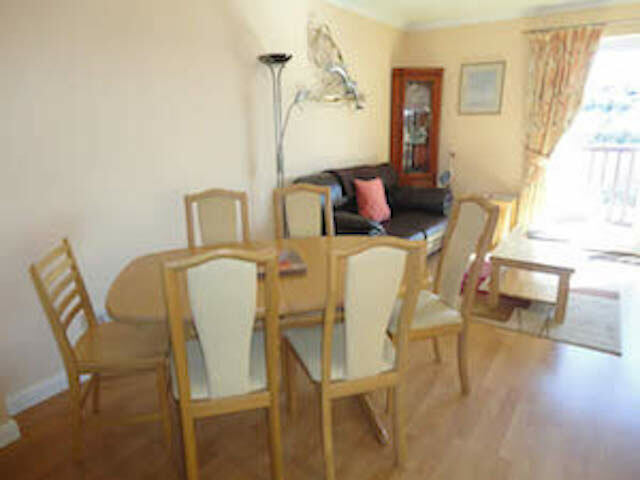 We have used Stay in the Havens to book accommodation in Broad Haven and Little Haven on numerous occasions. 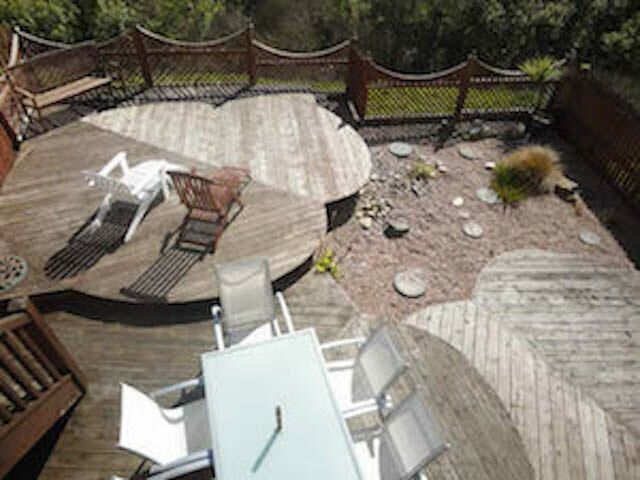 Karen is always fantastic and accommodating and the houses are always well maintained, clean and welcoming. 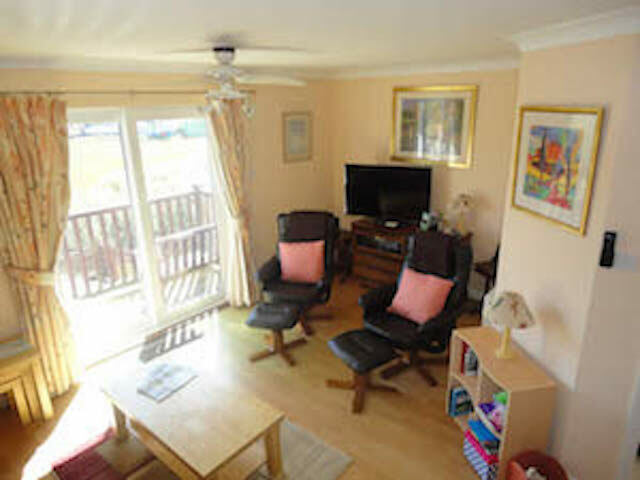 On our last trip we stayed in 85 Puffin Way which has stunning views of Broad Haven beach from the decking, balcony outside the lounge and one of the double bedrooms. It is only a 2 minute walk to the shops and the Galleon Inn. We even came 2nd in the pub quiz on this occasion. We had a lovely stay yet again, the weather was better than expected and the house we stayed was very well equipped and homely. We look forward to returning very soon. Staying here is such a pleasure, such a warm and friendly house, immaculately clean, superbly equipped and perfectly positioned in what must be one of the most charming little villages on this magnificent coastline of beautiful bays. Another wonderfully relaxing holiday. Thanks. We have had a lovely time, very relaxing and peaceful despite the showers but we missed the storm. The house is gorgeous, most well equipped and organised ever. We will be back soon we hope. Thank you very much to all the team of 'Stay in The Havens' - all your hard work much appreciated by us all. Our 4th time staying in no. 85! Another lovely visit once again as always. Great house and well equipped once again! Weather wasn't so kind to us but still a very relaxing and enjoyable stay. A lot of things to do and see in and around Pembrokeshire, even went to Heatherton and got mum involved in go karting!! Very funny. Thank you once again. Excellent house. Really enjoyed our stay. Lovely surroundings and also lovely weather! We will definitely return (hopefully to this house)! House is really well equipped. Just one suggestion.......could the window seat windows be made more child-friendly by having their opening restricted in some way? Kind regards and thanks for a lovely stay. NB from Karen - the owner will be looking into having the opening of those windows restricted for the 2014 season. Second time to No 85, love the house, area everything good - weather a bit 'iffy'. We always have to go for 'Pet Free' house so were puzzled by 2 dog bowls in cupboard!!! Found tumble drier took a long time to dry and couldn't quite work out timer for heating. Thank Karen for her pleasant manner and help. See you again. NB from Karen - New tumble dryer installed. This was our second time in No 85 and we had a super week as expected. The house has everything you want and then more things which might be needed! (in emergencies!). Much better equipped than home. We have to say that this visit we were delighted that we mastered the black and orange rubbish bag system and put the bin out on the right day! Another fantastic 'Stay in The Havens' holiday. As always - thanks to Karen. We'll be back next May. Had a relaxing 10 days. Broad Haven is a place to windsurf, walk and when it is good weather enjoy the surrounding coastline. We have stayed at 'Puffin Way' on a few occasions now. Karen always gives us a warm welcome. The house is a home from home. Look forward to staying again. Regards. Come down to escape Christmas! Lovely house, comfortable, warm, cosy. Kitchen great as all the facilities - thank you. We managed some walks despite torrential rain, storms and wind - still love Pembrokeshire and Broad Haven. This is the second Puffin Way home we've stayed in, managed by Karen - superb standard, would stay here again (and hope to soon!). A fave walk is to Little Haven along the beach at low tide (check tide times! ), pub lunch at the Castle and stroll back over the top road. Lovely. We'll be back. House superseded out expectations with more than everything we needed! Karen was very pleasant, efficient and helpful and couldn't have been nicer to deal with. We will recommend 85 Puffin Way to our friends and hope to return for another stay. 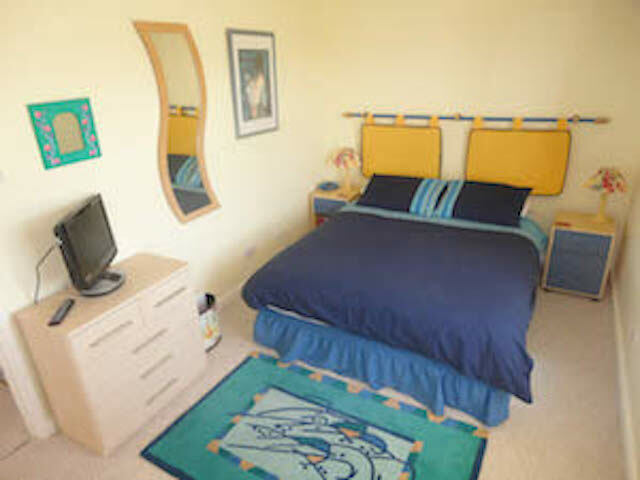 We have stayed in numerous holiday accommodation within close proximity and 85 Puffin Way is one of the best yet. It's location and furnish standard is second to none. The 3 storey living has been ideal for our needs for 2 families. Weather has been great for this time of year and dining at the 'Swan' in Little Haven is recommended for a fine catch of the day menu. All in all this has been a lovely relaxing break in fab accommodation. Thank you and we will be back again. Had a lovely stay, house in a great location and very comfortable! Will definitely consider coming back next year! Amazing house, well equipped with everything you can think of! Best we have ever stayed in. My husband could check out the surf every morning from out bedroom window! One week not long enough, looking forward to staying here again. A lovely house in a great location. It had everything we needed. Sadly, weather wasn't kind to us but still had an enjoyable time. Narberth great for independent shops including Ultralorrida Spanish Tapas bar and deli. Indoor karting at Haverfordwest good when weather was poor or Blue Lagoon. Thanks to Karen for preparing everything for us.